If you have an Apple computer, it’s easy to create video of your website to use in your video for Background Video, or B Roll, especially if you are making a video to promote yourself, career or your business. You might only use a few seconds of your screen video in a video production, but it’s good to know how to record a screen video on your computer. If you have websites you have designed, WordPress sites or want to show a video clip from your YouTube or Vimeo channels, this is also a great opportunity to share and promote your career. You might need to download or update application, see details at Apple. Web Browser – Have the web browser, (that’s Safari, Firefox, Chrome, Opera and more) for the website open you want to record. Open and adjust browser so you can have the best view possible of the website. Grab the side of the web browser to adjust width or a corner to adjust width and height. Find QuickTime Player – Use the search or magnifier, located in the top toolbar on your desktop, search for QuickTime Player. You can go to your Applications and also search for QuickTime Player. Launch QuickTime Player – Click on QuickTime Player and it will launch. In the top toolbar on desktop, go to File, select new Screen Recording. A Start Record message will appear, select, and recording will start. Show and Tell – Now just navigate with your mouse or touch pad on your website, what you want to show. Make smooth movement, up and down, not herky-jerky. Think about this the same way you would create a panning shot with a video camera, left to right movement, or a tilt shot, up and down movement. If it’s difficult to watch a video clip, then it will only distract from your video production. 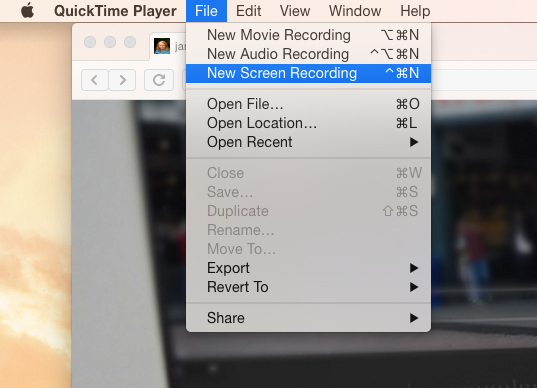 Stop Recording – To end recording, go to the top of your desktop window, look for a round button, select, and a QuickTime video will appear. Go to File, Save and Name Video – In the top of the tool bar, Go to File save, and name the video and select the location to save. Watch video – You should watch video and make sure it’s what you want, or make another screen video recording. *You might need to practice recording screen video a few times before you are confident with the process. Add video clip to video production – The video is ready to add to your video production, such as Adobe Premiere Pro CC, Final Cut Pro X or iMovie or more! You can also upload directly to YouTube now if video is not part of a video production or there’s no required editing. 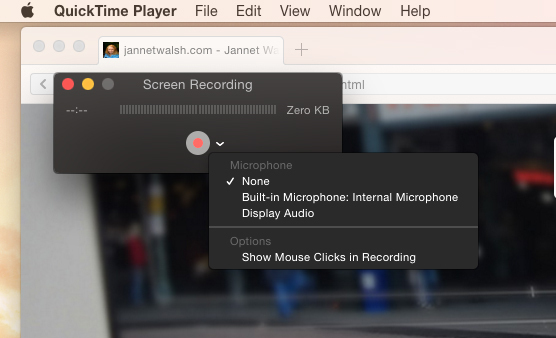 Audio, Optional – If you want to record audio with your screen video, when the record box with the red button appears on your desktop, select the drop down arrow next to the red button. Next, select how you want to record audio, selecting internal or an external microphone, preferred method. Note: If you are just adding your video to video project as background video, and don’t need additional audio, skip this step. Posted in AdobeTagged Adobe Premiere Pro CC, Apple Computer, Quick Time, QuickTime Player, Screen VideoBookmark the permalink.